Home DIY Projects	Best Creamy White Spray Paint? Happy #GivingTuesday, Friends! Did you give to your favorite charity online today? How was your Thanksgiving? Did you get all of your shopping done this weekend with the Super Sales? I did a little, but I saw my favorite spray paint in the garage today and it reminded me of something. I wanted to share with you my best creamy white spray paint! A few weeks ago I decided to tackle a few outdoor project before it got too cold. Now I’m glad I did! Brrrr! It turned cold! The two projects I wanted to complete before winter were two wrought iron pieces. One is a door mat my sweet former neighbor gave me. We had it at our lake house, but it wasn’t the perfect spot. So, It ended up on our outdoor terrace at the new house. It looked great out there, but unfortunately the weather got the best of it and it started to rust. Worse, it started to rust on the terrace stones which my husband just pressure washed. (He was not happy.) You can see it was originally white, but now rusty. I gave the mat a quick wire brush cleaning, and wiped it down. Then, I spray painted it with a white semi-gloss paint I had on hand. It was TOO white. So, a quick trip to Lowe’s and I found the perfect shade of paint. It’s called French Creme by Rust-Oleum. 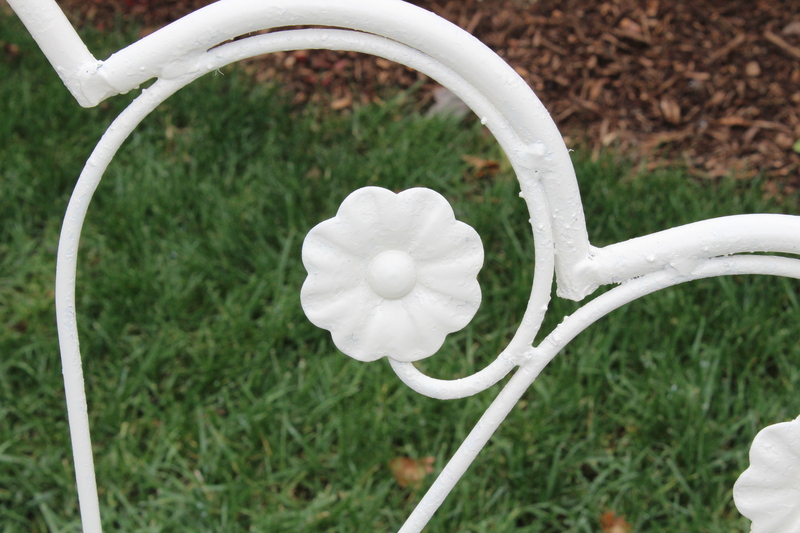 ( Rust-Oleum French Cream Spray Paint here ) I must say this is the yummiest shade of white! It’s not yellow at all and not too stark of a white. Just a perfect creamy white. I painted the back side first then after that dried, flipped it over and covered the front with a few light coats. Much better, right? Here’s a side by side comparison. Now the sweet little squirrels are ready for winter! They have a fresh new coat of paint and from the looks of it, lots of leaves and acorns! And they won’t rust on the terrace. Bonus? The extension cord to my outdoor Christmas lights tucks neatly under the mat so no one trips. This is the rusty little bench before. After a few coats of French Creme, the little bench is good for another few years! One thing I really miss in the winter is the ability to spray paint outside. Thankfully, I was able to complete a lot of my to-do list before it turned too cold. Honestly I have no idea how old this little bench is, but I’ve had it for about 10 years and this is its second paint job. I admit the bench is not that comfortable a seat, but it looks darling in my garden. And now I know it will last many more years with a little TLC. Don’t you love the floral details? I do! I always love a good before and after. Of anything really. Like a bad blogger, I am just now fishing out my Christmas decorations. I am one of those people that must tackle one holiday (or project) at a time before I’m ready to fully commit. But, I’m ready! Now, I just need to figure out where to put my decorations in the new house. AND, where to buy fresh greenery? I have some beautiful red berries and some holly at our lake house, but otherwise, I”m stumped. My next door neighbor has a gorgeous Magnolia tree so I’m hoping to persuade her to donate a few leaves to my cause.